Soak in a world of timeless beauty and traditional life for 4 days. 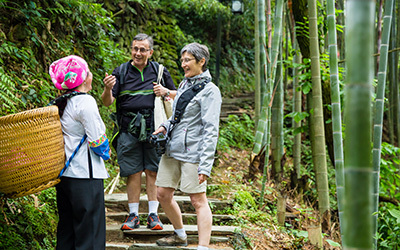 Walk on small rice terrace paths in photogenic Longsheng. There you will delve beneath the surface, visiting an ethnic family and exploring their centuries-old lifestyle. 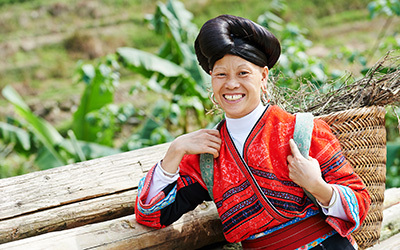 Escape to Yangshuo’s supremely scenic countryside and try some farm work with a local family. 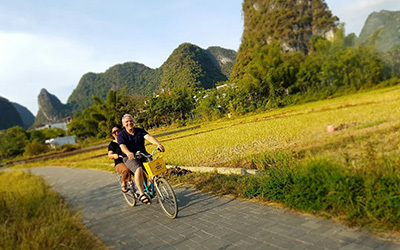 Our 4 days tour of Guilin, Yangshuo, and Longsheng is private and flexible, which means no hurrying and no wasted time. Put your mind at ease with our one-to-one tour service and money back guarantee. 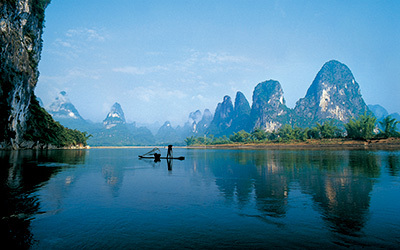 Our 4 days tour of Guilin, Yangshuo, and Longsheng is private and flexible, which means no hurrying and no wasted time. Put your mind at ease with our one-to-one tour service and money back guarantee. Feast your eyes on the best scenery of the Longji Rice Terraces. Visit a minority family and explore their centuries-old lifestyle. Hop on a local tractor in Yangshuo and escape into the timeless landscape. Try some farm work in the fields of Yangshuo’s countryside with a local family. With buildings surrounded by mountains and rivers, Guilin might strike you as a small laid-back town yet its charm calls out to you to explore it. Upon arrival in Guilin, you will have a lot of free time to discover the city on your own. As most flights from big cities, such as Beijing, Xi’an, and Shanghai, land during the afternoon, the rest of the day is left free for you to spend at your leisure. Reed Flute Cave, Li River Stone Drawing, and walking along Binjiang Road are good ways to spend your time if you’d rather go out and explore. After breakfast, start exploring Longsheng. Usually, it takes 3 to 4 hours to get there on the mountain road. You will travel on the highway instead, to shorten the journey to 2½ hours. Arriving at the famous terraced rice fields, you can either walk up or take an electric buggy to get to the top. The Longji Rice Terraces are known widely for the awe-inspiring view, particularly when they turn golden during autumn. With autumn undoubtedly being the best time to get perfect photos, the other seasons also boast unique beauty, too. Standing on top of such a huge man-made wonder is itself an extraordinary experience. When you get back down, you will enjoy lunch with a Yao family who invite you into their home. First, you will learn how to stuff and cook rice inside a bamboo tube. Then you will sip the freshly-extracted oil tea that keeps the farmers warm in harsh winters. You will return to Guilin by the evening. Listed as one of the world’s 15 best rivers for travelers by CNN, the Li River presents itself differently in each season and there are different ways you can appreciate it. You will enjoy the most classic way: a cruise from Guilin to Yangshuo. To maximize your experience, we will arrange a 4-star cruise for you, which is the highest level. It offers better facilities and a buffet lunch. The entire journey starts with a smooth transfer from your hotel to the pier. 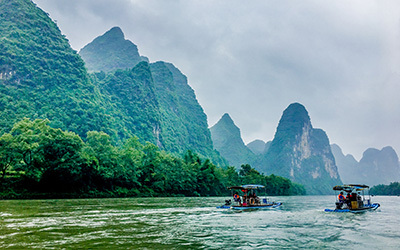 Staggering limestone formations are scattered along the riverbanks and the scenery changes from a cityscape to rural tranquility as you approach Yangshuo. Take a short break after checking in at your hotel in Yangshuo. Meanwhile, your private tour guide will prepare the bikes or electric scooters for you (a private car is also available if you prefer). After your break, it’s time to ride along the country roads. As China is developing at full speed, pastoral lifestyles can rarely be seen elsewhere. 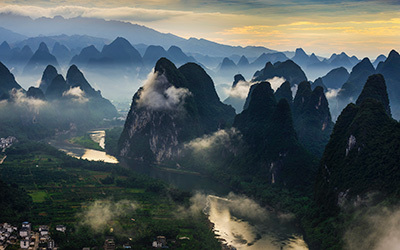 Yangshuo’s countryside is one of the handfuls of places left that reminds you of nature’s quietness and pureness. Enjoy a relaxing night in Yangshuo. Yangshuo offers a relaxing atmosphere and various activities: a cooking class, a tai chi lesson, a farming experience, and even rock climbing. Day 4 — Yangshuo–Guilin | Until Next Time, Guilin! Unlike most Western countries, agriculture in China depends greatly on manual work rather than machinery and some traditional farming methods have been passed down for generations. Check them out during your last day in Guilin. Pay a visit to a local farmer’s house in Gaotian Village. The host will walk you around his/her fields and brief you about the work that needs to be done during the day. Spend a couple of hours helping out, either in the fields or in the backyard barn, ploughing, harvesting, and stocking, to name a few of the farming activities. Sit down with the family for a home-cooked lunch and exchange your life stories. Nothing could be more meaningful than getting a glimpse of people’s lives from a totally different culture while yours is also being shared. With great memories, you will leave Guilin in the afternoon.